This is a demonstration on how to prepare and administer Meropenem using an aseptic non-touch technique (ANTT®). Captions provided for in situ use by healthcare professionals working in the Emergency Department. The ANTT should also be applied to the administration of other IV drugs. Obtain a clean blue tray. Disinfect your hands with Cutan® hand sanitiser foam; allow to air dry. Put on new pair of non-sterile gloves. Disinfect tray with Chlor-Clean and allow to air dry. Dispose of Chlor-Clean wipe and gloves. Gather all other equipment around the tray (as shown below). Write ‘MEROPENEM’ on the antibiotic label. Second checker to sign prescription at the appropriate place. Disinfect your hands with hand sanitiser foam; allow to air dry. Open first green needle wrapper and place needle in tray within open paper wrapper. Open 10ml syringe and connect to needle Luer-Lok™; place back in tray without wrapper. Open NaCl vials and hold both in one hand. Keeping key part of vial untouched, unsheathe needle. Lock needle guard within blue tray against the base. Place loaded syringe and sheathed needle array in tray. Place '0.9% saline' label on syringe. Discard meropenem plastic top and place vial in blue tray. Wipe vial top with first 2% chlorhexidine gluconate in 70% alcohol wipe and let top air dry in blue tray. Open second green needle wrapper and place needle in tray within open paper wrapper. Open 20ml syringe and connect to needle Luer-Lok™; place back in tray without wrapper. Open water vials and hold in one hand. Keeping key part of vials untouched, unsheathe needle. Push green needle on the water syringe into meropenem vial. Inject in 5ml batches, allowing the plunger to recoil before next batch (this avoids build up of pressure in vial). Remove needle and syringe from vial. 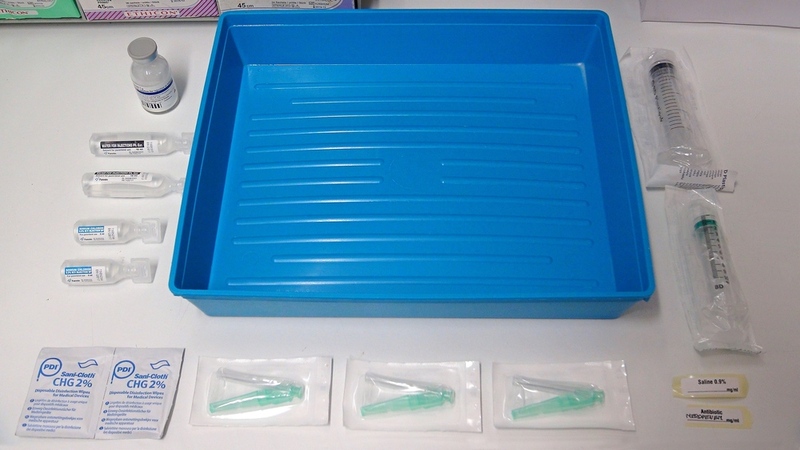 Place empty syringe and sheathed needle array in tray. Keeping key part of vials untouched, shake the vial continuously in the palm of the hand for 60 seconds. Place vial in blue tray and allow to rest for 15 seconds. Shake the vial for a further 60 seconds. Place vial in blue tray and allow to rest for a further 15 seconds. Pick up vial and check for clarity and colour. Remember: Reconstituted solutions are clear, range from colourless to yellow, and are free of particles. If required, shake for further one minute or until all the powder has dissolved (may take longer). Open third green needle wrapper and place needle in tray within open paper wrapper. Remove needle still attached to empty 20ml syringe and attach the new needle instead. Draw 20ml air into syringe. Push needle into syringe just beyond rubber stop and hold vial upside down. Push 10ml air into vial and allow plunger to recoil by itself. Repeat until all fluid in vial. Lock needle guard within blue tray. Place 'MEROPENEM' label on syringe. Place second 2% chlorhexidine gluconate in 70% alcohol wipe into tray. Take blue tray with equipment and prescription to patient. Check patient’s wrist band against their identifiers on ED record. Clean connector with second 2% chlorhexidine gluconate in 70% alcohol wipe for 30 seconds. Detach needle from meropenem syringe and push syringe into connector. Administer meropenem by slow IV injection over 5 minutes (i.e. around 1ml every 15sec). Ensure there is no pain on injection. Detach empty antibiotic syringe from connector, ensuring not to touch connector’s key part. Drop empty syringe into blue tray and pick up syringe with 0.9% saline flush. Detach needle from flush syringe and push syringe into connector. Flush IV line with the 0.9% NaCl. Detach empty syringe and drop it into blue tray. Ensure that there is no immediate reaction. Discard all your sharps and consumables. Place blue tray back where it belongs. Sep 29 Suspected SAH: Do we still need the needle?